Throwing stones at castle walls is one way to attack an enemy, but sneaking inside makes the target much more vulnerable. Researchers at Cedars-Sinai's Maxine Dunitz Neurosurgical Institute have employed a similar strategy using a mouse model to target important mechanisms inside the most challenging breast cancer cells. Earlier studies at Cedars-Sinai found a similar approach effective in attacking malignant brain tumor targets. Unlike other drugs that target cancer cells from outside and often injure normal cells as a side effect, this therapy consists of multiple drugs chemically bonded to a "transport vehicle." The drugs bypass healthy cells, accumulate inside tumor cells and attack molecular targets that enable cancer cells to grow and spread. Studies using a mouse model show this highly targeted approach, using combinations of drugs, to be more effective than standard treatment methods. This research targeted HER2-positive breast cancer – a type that, due to a genetic mutation, makes excessive amounts of a protein that promotes the growth of cancer cells. HER2-positive breast cancers tend to be more aggressive and less responsive to treatment than other breast cancers. One commonly used antitumor drug, trastuzumab (Herceptin®), is sometimes beneficial, but with advantages and disadvantages. It is an antibody to the HER2 antigen, which means it naturally seeks out this protein in cancers. But its effectiveness as a treatment usually is limited because in 66 to 88 percent of patients, the tumors become resistant within the first year of treatment. Herceptin also can injure normal organs it contacts. The researchers reported in their recent studies, published in the February 19, 2011 issue of Cancer Research, that the new drug carried multiple molecular components, each with a distinct role. Researchers at Queen’s University Belfast in Northern Ireland have issued a stark warning about the future of the Irish hare and the threat it faces from the European ‘brown’ hare, which has set up home in Mid-Ulster and West Tyrone. Dr. Neil Reid from Quercus (Queen’s University’s Centre for Biodiversity and Conservation Science), said: “In March 2011, the Northern Ireland Assembly voted to outlaw hare coursing in Northern Ireland to protect the future of the Irish hare. But our native hare remains vulnerable to another serious threat – that of the invading European hare.” European hares are found in Britain and continental Europe, but they have been highly successful in invading many countries beyond their native range in south-west Europe and parts of Asia. There have been many studies on their impact on native species. Dr. Reid reviewed these studies to get a clearer picture of how much of a threat the invading species might be to the Irish hare. The study, published in the March 2011 issue of the international journal Biological Invasions, suggested that European hares exhibit strong competition for habitat space and food resources with native species, most notably other hare species. It also warns that disease and parasite transmission and climate change may give the invading European hare an edge over the native species. Dr. Reid added: “The Irish hare represents an evolutionary unique lineage, which is restricted to Ireland where it has been present since before the last glacial maximum, making it one of our few native mammal species. Hence, it has been isolated for 30,000-60,000 years. Researchers at the University of Michigan Comprehensive Cancer Center have developed a new drug called AT-406 with potential to treat multiple types of cancer. A study published online on March 28, 2011, in the Journal of Medicinal Chemistry showed that AT-406 effectively targets proteins that block normal cell death from occurring. Blocking these proteins caused tumor cells to die, while not harming normal cells. The researchers believe the drug could potentially be used alone or in combination with other treatments. The normal cell death process, called apoptosis, is what keeps normal cells in check. When apoptosis is disrupted, cells reproduce uncontrollably, which is a hallmark of human cancer. "Removing key apoptosis blockades in tumor cells is a completely new cancer therapeutic approach and could have benefit for the treatment of many types of human tumors," said study senior author Dr. Shaomeng Wang, Warner-Lambert/Parke-Davis Professor in Medicine and director of the Cancer Drug Discovery Program at the U-M Comprehensive Cancer Center. Dr. Wang's laboratory has been pursuing new cancer treatments aimed at this cell death pathway since 2003. His team designed and made AT-406 and tested it in the laboratory in 2006. The small-molecule drug homes in directly on the proteins – called inhibitor of apoptosis proteins or IAPs – that block cell death. The researchers found that AT-406 destroyed these proteins in cancer cells. Meanwhile, the drug had little to no effect on normal cells. In animal models, the drug shrank tumors but caused few side effects. The drug is designed to be taken by mouth, which researchers say will make it easier than traditional intravenous chemotherapies to administer. A drug approved to treat certain types of cancer has shown promising results in the treatment of patients with scleroderma, according to results from an open-label Phase II trial. 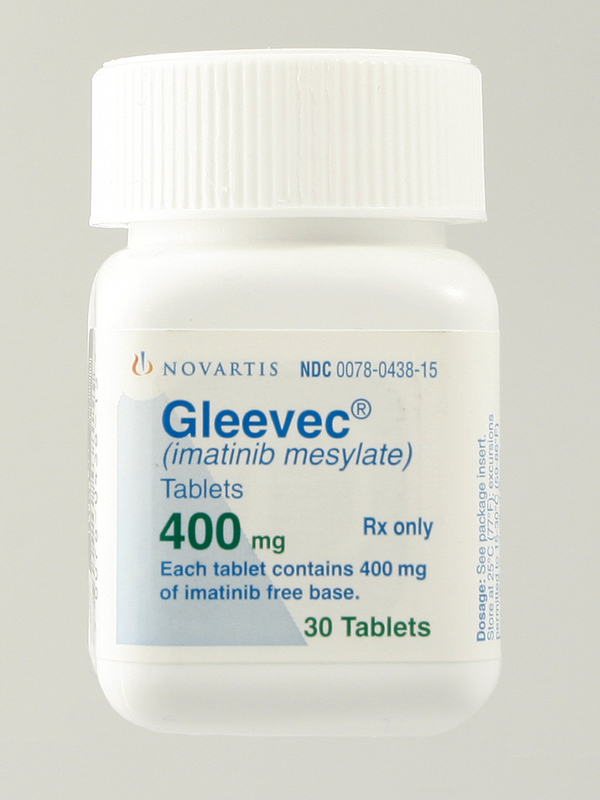 While the drug's efficacy must be demonstrated in a Phase III trial, the gold standard for testing a drug, researchers are optimistic that Gleevec (imatinib) could potentially be a weapon against the chronic connective tissue disease for which a treatment has remained elusive. "This trial showed Gleevec has acceptable safety and tolerability, and there are hints of efficacy or suggestions the drug may work," said Robert Spiera, M.D., an associate attending rheumatologist at Hospital for Special Surgery who led the study. "This study strongly suggests that a randomized placebo-controlled trial is warranted." The study appeared online on March 11, 2011, in Annals of the Rheumatic Diseases. Systemic scleroderma affects not only the skin, but also underlying blood vessels, and often muscles and joints, as well as the gastrointestinal tract, kidneys, lungs and heart. According to the Scleroderma Foundation, roughly 300,000 individuals have scleroderma in the United States and roughly a third of these have the systemic kind. The disease typically strikes in the prime of patients' lives, when they are 30-50 years old. To date, there has never been a drug that has been shown to be effective for scleroderma. For the study, investigators at Hospital for Special Surgery enrolled 30 patients with diffuse scleroderma, a widespread severe form of the disease, and gave them 400 mg of Gleevec per day. Patients were evaluated monthly for 12 months during treatment and were seen for follow-up three months after discontinuing the drug. Scientists at Berkeley Lab’s Molecular Foundry and colleagues have pioneered a new chemical mapping method that provides unprecedented insight into materials at the nanoscale. Moving beyond traditional static imaging techniques, which provide a snapshot in time, these new maps will guide researchers in deciphering molecular chemistry and interactions at the nanoscale—critical for artificial photosynthesis, biofuels production, and light-harvesting applications such as solar cells. “This new technique allows us to capture very high-resolution images of nanomaterials with a huge amount of physical and chemical information at each pixel,” said Dr. Alexander Weber-Bargioni, a postdoctoral scholar in the Imaging and Manipulation of Nanostructures Facility at the Foundry. “Usually when you take an image, you just get a picture of what this material looks like, but nothing more. With our method, we can now gain information about the functionality of a nanostructure with rich detail.” The Molecular Foundry is a U.S. Department of Energy (DOE) Office of Science nanoscience center and national user facility. With the Foundry’s state-of-the-art focused ion beam tool at its disposal, Dr. Weber-Bargioni and his team designed and fabricated a coaxial antenna capable of focusing light at the nanoscale, – a harnessing of light akin to wielding a sharp knife in a thunderstorm, Dr. Weber-Bargioni said. 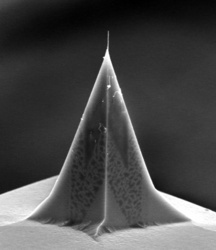 Consisting of gold wrapped around a silicon nitride atomic force microscope tip, this coaxial antenna serves as an optical probe for structures with nanometer resolution for several hours at a time. What’s more, unlike other scanning probe tips, it provides enough enhancement, or light intensity, to report the chemical fingerprint at each pixel while collecting an image (typically 256 pixels x 256 pixels).